Portland Plaza is a very nice downtown, Cultural District condominium building. The upper floors have wonderfull views of the city, river, and mountains. Units have large floor to ceiling windows. The area is known for arts & entertainment, parks, Farmers Market, shopping, movie theatres, restaurants, and Portland State University. It's served by both Max light rail and the Street Car line. Amenities include an outdoor swimming pool, spacious outdoor patios, fitness room, reading library, secured parking, and 24hr concierge/security. There are 9 listings found for Portland Plaza. Updated unit with wonderful eastern view. 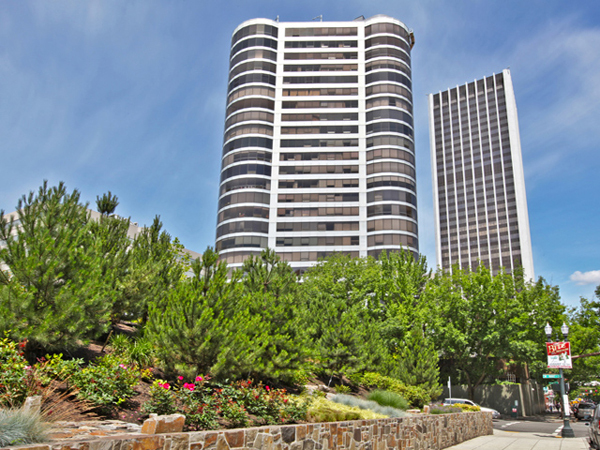 The condo overlooks Keller fountain, Mt Hood, and the stunning Plaza grounds. Open island kitchen with custom cabinets. The floors are travertine- the counters are granite. Pass-through 2nd bedroom may be an office or guest room. Extra storage & organized closets in the master suite. Move-in ready. All appliances and deeded parking included.Come live in the city and enjoy being above it all! Remodeled Condo with Panoramic Views in the Heart of the City. Situated in the iconic Portland Plaza this unit has one of the rare open concept kitchen/living areas. Deeded parking spot included complements a Walk Score of 99. A 24 hour Concierge, Private Gym, Pool and Library are among a few of the vast amenities. Modern updates and views of Mount Hood while you dine accompany the recent multi-million dollar renovation to the Plaza. Luxurious penthouse suite offers breathtaking views of the west hills & downtown. Privacy glass. 10-ft ceilings. Updated gourmet kitchen. Heated floor in master bath. Custom built-in desk, ent. center, storage & CA closets. Bldg. remodel w/library, gym & party rm. New exterior commons incl. heated saltwater pool, fire pit & outdoor kitchens. Secure entry & 2 deeded parking spaces. Near Farmer's Market, museums & theaters. Walkscore 98.